Whenever I ask men to choose their favorite dessert, they nearly always answer by naming some sort of cream, custard or pudding. I don’t really have a theory about this but I fully understand why custard would be anyone’s favorite. Crème Brûlée has been such a standard on dessert menus for years along with Butterscotch Pudding, Crème Caramel or Flan. Custards and creams are super satisfying desserts that really deliver on pure flavor and comfort when made from scratch using the best ingredients. 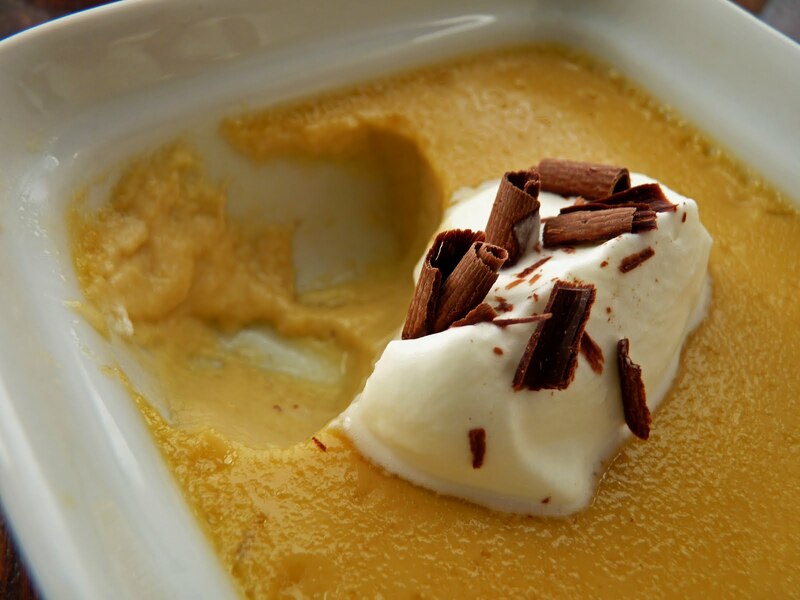 This dessert is a very simple and delicious custard with an adult profile. 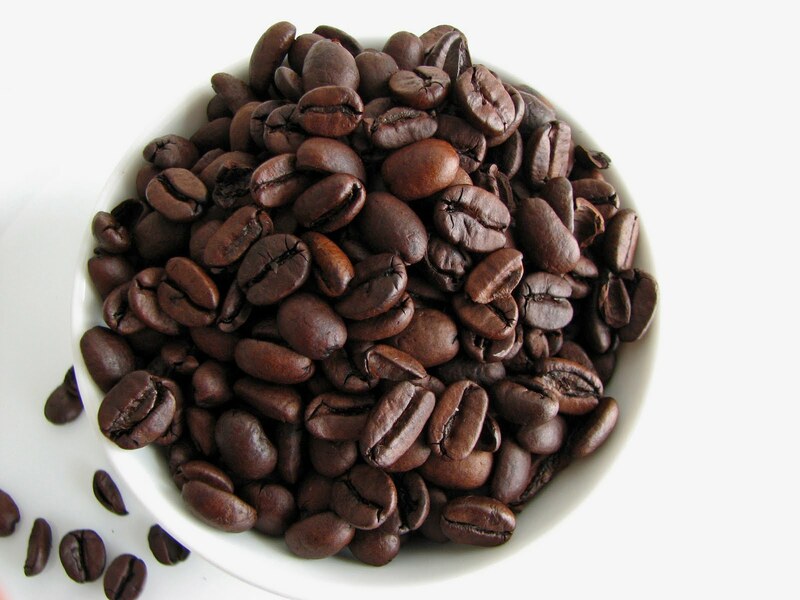 It’s steeped with coffee beans and flavored with a tiny nip of brandy. It’s creamy and luscious and hits all the right after dinner notes. Perhaps you know a few good men who would especially enjoy it? 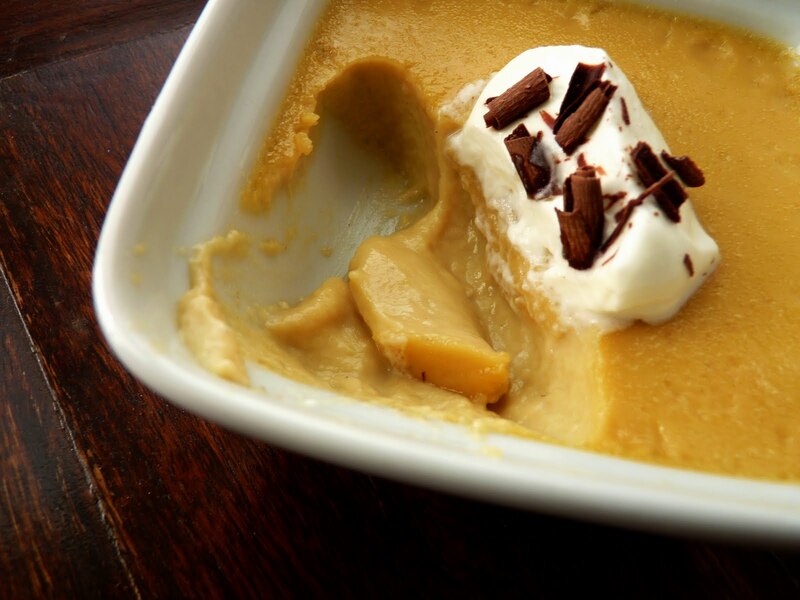 - Custards are baked in a bain marie or water bath to ensure a soft creamy texture through slow and gentle cooking. For best results, bake until the edges are set but the center area about the size of a quarter is still jiggly when you wiggle the custard cup. - If you want a richer, creamier texture, use 2 cups of heavy cream and eliminate the milk. - I usually bake custards in two smaller bains marie rather than one large pan to ensure ease of handling when removing from the oven. I use tongs to remove the ramekins from the water bath. - These custards will keep covered and refrigerated for a day. Bring to room temperature before serving. Preheat oven to 350 degrees. Set out six 6 oz ramekins in one or two baking pans. Slowly bring the heavy cream, milk, sugar and pinch of salt to a simmer. Remove from heat and add the coffee beans. Stir, cover and steep for one hour. Pour the cream mixture through a sieve to strain out the coffee beans. Reheat the mixture until just warm. Whisk the egg yolks and slowly add the warm cream mixture, whisking constantly. Add the vanilla and brandy and whisk thoroughly. Distribute the custard into ramekins. Pour hot water into the pan(s) until it reaches halfway up the sides of the ramekins. Carefully place the custards in the oven and bake for about 32 - 35 minutes. The edges of the custard should be set and the centers (about the size of a quarter) should jiggle slightly when the cup is gently wiggled. Remove the custards from the oven, then carefully take them out of the water bath and place on a wire rack to cool. If you wish to garnish the custards, whisk 1/4 cup of heavy cream with a small pinch of sugar until soft peaks form. Dollop each custard with whipped cream and sprinkle with dark chocolate shavings. I’ve really been missing spring fruit lately so when I saw some beautiful and very inexpensive blackberries at the market, I scooped them up. They were not locally grown but I just couldn’t help myself. They’re imported from Mexico and they are deliciously sweet and juicy. 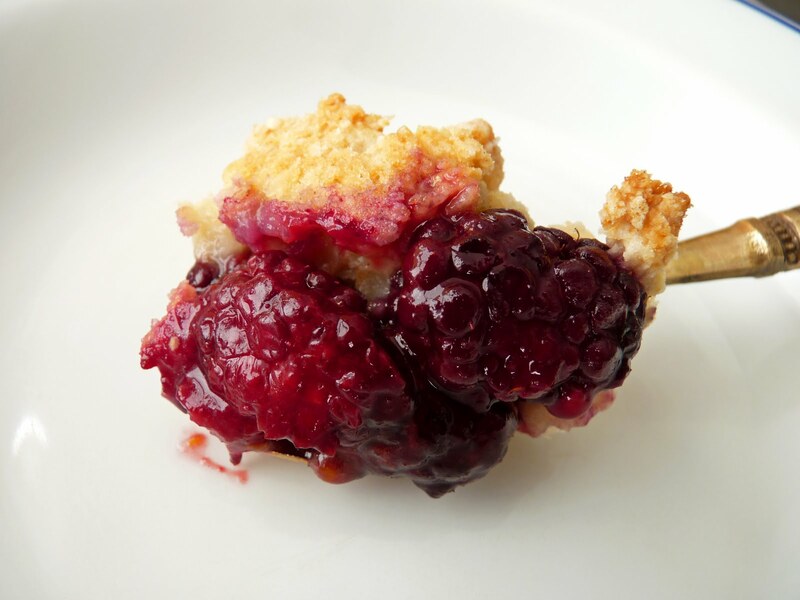 In order to best enjoy their bright fresh flavor, I decided to keep their preparation simple by making a very basic cobbler. Cobblers come from a terrific family of rustic baked fruit desserts such as Crisps, Grunts, Bettys, Pandowdy, Slumps and Buckles. They are very quick and easy to create with the simple combination of a few basic ingredients. In this preparation, the berries are enhanced with some sugar, orange zest and the perfectly delicious pairing of cinnamon. The cobbler topping is light and just the right sort of texture to top off the lusciously baked fruit. The whole dessert comes together in just a few minutes and provides a great treat to hold us over until we arrive at the beautiful bounty of spring. 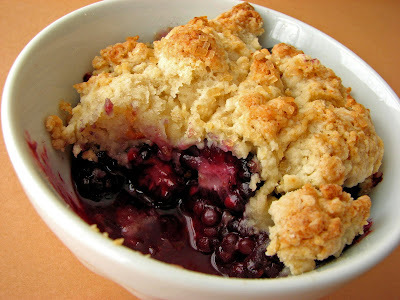 - If you don’t have berries in your midst now, try this with pears or apples. Switch out the orange zest for lemon, use your favorite spices and you probably don’t need any flour. Toss in some dried cranberries or a couple of finely chopped medjool dates. - Always taste your fruit first and if it isn’t particularly sweet, adjust the sugar. 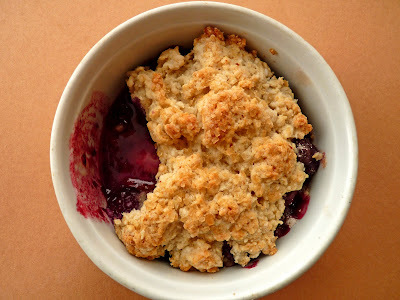 - I made individual servings but you can also use a baking dish large enough to hold the berries for one large cobbler. - For another great winter dessert, try the super delicious Winter Fruit Crisp. For the filling, toss the berries with the sugar, flour, cinnamon and orange zest to evenly coat all the fruit. Set aside. For the cobbler topping, whisk together flour, sugar, baking powder, baking soda and salt in a mixing bowl. Slice cold butter into small pieces and add to the flour mixture, tossing to coat each piece. Using your fingers or a pastry blender, blend the butter into the flour until the mixture looks like coarse crumbs. Combine the buttermilk and vanilla and add to the flour and butter mixture. Stir with a fork until just combined without any dry patches. Do not overmix. The dough should look lumpy and crumbly. Toss the fruit and distribute into 6 ramekins or one baking dish. Distribute the dough evenly on top of the berries. Brush top of the dough with melted butter and sprinkle generously with sugar. Bake until filling is bubbly and the topping is golden brown, about 25 to 30 minutes. Serve warm or at room temperature. I’m just about at the point where I’m really longing for the arrival of fresh and local spring fruit. I’m anxious to add the bright pop of gorgeous berries and stone fruit to replace the every-shade-of-brown palette of fall. Although I do love fall ingredients, I absolutely miss the lightness and color of spring pastries on these pages. But it’s going to be a while before we can experience that first sweet sighting, so I will need to refocus on the ingredients at hand. Tough job, I know! Today I turn to the ever reliable sunshine flavor and brightness of orange for our little mid-winter pick-me-up. The welcome tang of citrus always appeals to me no matter what the season. 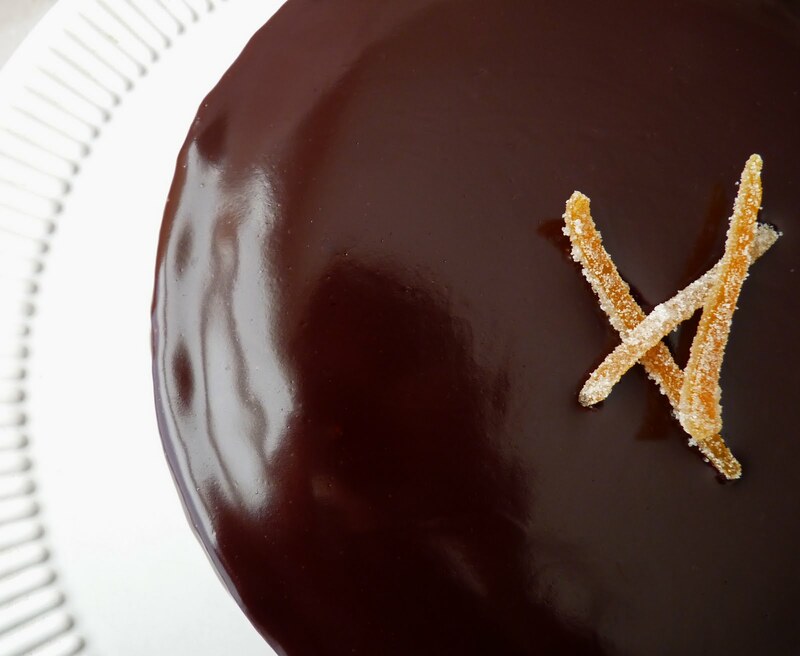 This is a simple and basic orange cake that benefits from some dressing up with a Chocolate Cardamom Glaze. 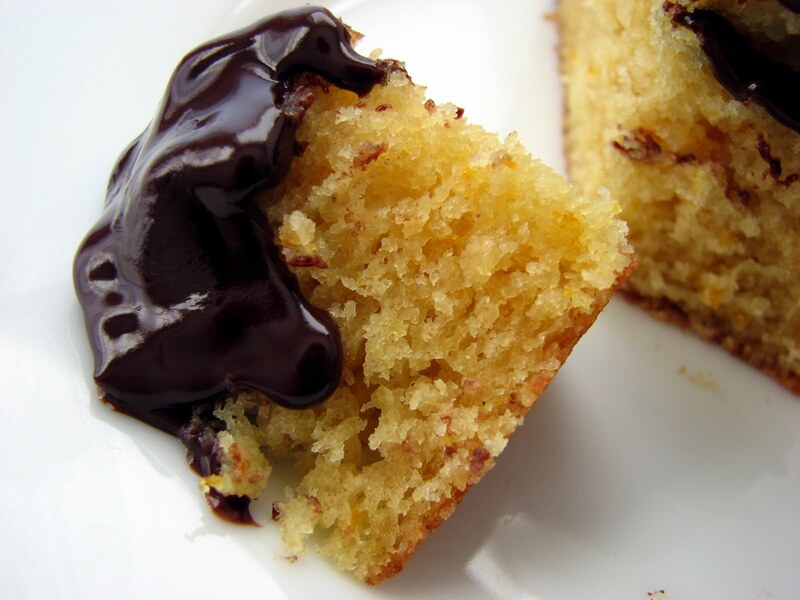 The cake is moist, not too sweet and has a nice open crumb. The glaze adds a luscious and fancy flair. It's not a fussy or complex flavor profile but a simple, fun and tasty way to head towards February, where I hope we’ll begin to see some wonderful blood oranges make their glorious appearance. In the meantime, grab a bite of citrus and chocolate, a hot cup of coffee or tea and stay warm. - If you don’t have buttermilk for the cake, you can substitute sour cream or plain yogurt. 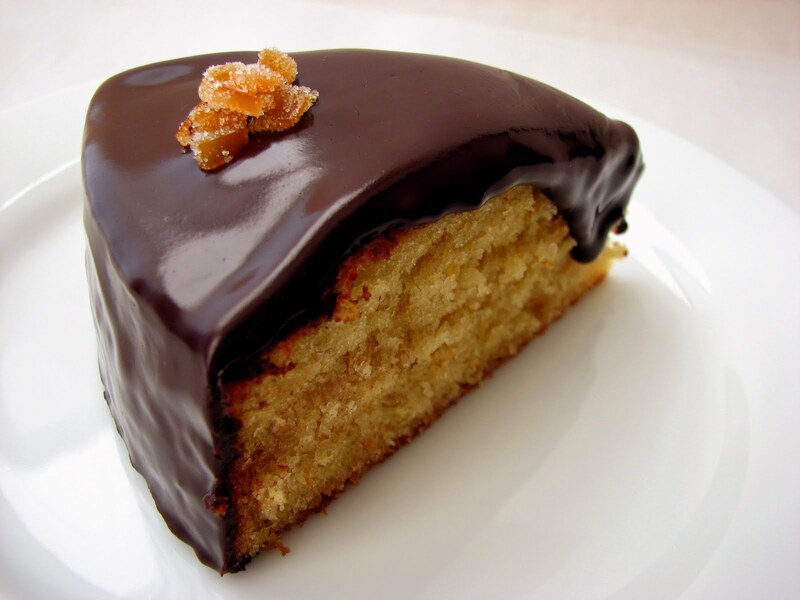 - This cake would also be superb with a simple orange glaze. Combine 1/2 cup orange juice with 1/2 cup of confectioner’s sugar in a saucepan and simmer to dissolve. Pour over the cake and let it set up. In fact, the cake is very versatile. You could serve it with a light dusting of confectioner's sugar or plain with fresh strawberries in their juices or a blackberry coulis when the time comes. - You can use bittersweet or semisweet chocolate for the glaze, depending on your own desired level of flavor and sweetness. Or you can do what I did in this instance since the cake isn’t terribly sweet, try half bittersweet and half semisweet. - The use of corn syrup adds to the viscosity and shine of the glaze. I rarely use corn syrup but in this preparation it is a fairly small amount. You can certainly leave it out if you wish. Preheat oven to 350°F. Grease an 8” x 2 1/2” cake pan and line the bottom with parchment paper. Combine the buttermilk, orange and lemon juices, and vanilla. Cream the butter and sugar until lightened and creamy, about 2 - 3 minutes. Mix in the orange zest. Scrape down the bowl and add eggs one at a time, making sure each egg is fully incorporated before adding the next ingredient. Scrape down the bowl and add the flour mixture in thirds, alternating with half of the buttermilk mixture and starting and ending with the flour, until it just begins to look like it’s nearly mixed. Remove from the mixer and use a rubber spatula to finish the mixing with a few folding gestures. Scrape the batter into the prepared cake pan and level it out evenly. Bake the cake until it is golden and a tester comes out clean, about 28 minutes. Cool the cake in the pan on a rack for 10 minutes, then turn out onto the rack. Carefully peel off the parchment paper, invert the cake onto an 8” cardboard round or removable tart pan bottom and cool completely. 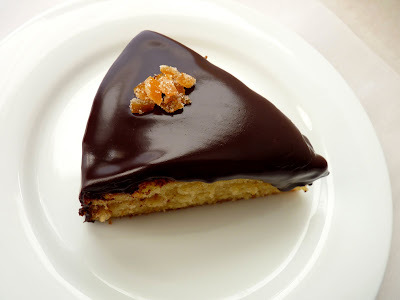 For the chocolate glaze, chop the chocolate into very small pieces and place in a medium bowl. To glaze the cake, place the cooled cake along with the cooling rack on a baking sheet lined with parchment. Strain out the cardamom and reheat the cream until just about to the boiling point. Keep your eye on it because it will spill over if left to boil. Pour the cream over the chopped chocolate and let it sit for about 2 minutes. Then stir slowly and gently, starting in the middle until thoroughly combined and then working outward in concentric circles until the mixture comes together. Glaze the cake, pouring quickly in the center and around the edges. Let it run for a few seconds and then gently tap the baking sheet on the work surface to encourage the glaze to run down the sides of the cake. Just as it begins to dry, run a small flat spatula around the underside of the cardboard round to smooth the bottom edge and prevent “feet” from forming. Let glaze firm up a bit before serving. A crostata is the Italian version of the French galette, which is a free form version of American pie. It’s a beautiful way to present a dessert that is both casual and easy to produce and a snap to serve. This crostata comes from Marcel Desaulniers by way of Rose Levy Berenbaum in her Pie and Pastry Bible. It’s chock full of toasted walnuts and a mixture of dried cranberries that are bathed in a creamy sugar mixture with a dash of cinnamon. It’s a very hearty winter pastry that isn’t heavy or too rich. 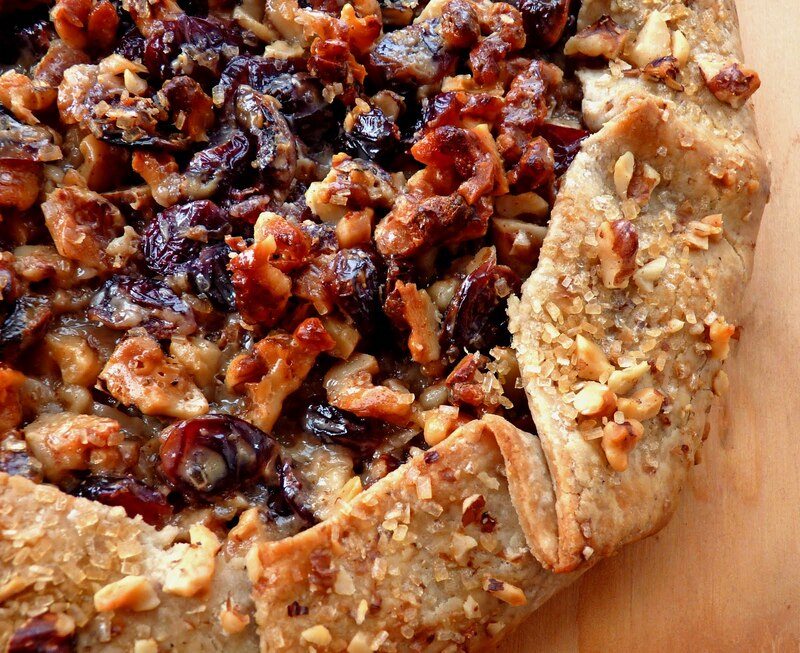 It’s only slightly sweet to showcase the tartness of the cranberries and the rich flavor of the toasted nuts. I think it's perfect for our winter season. 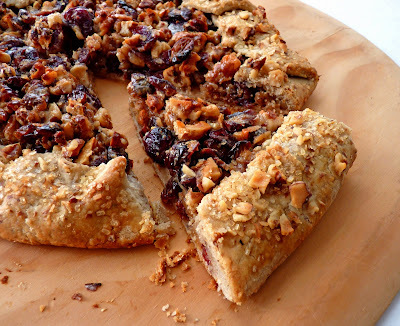 - You’ll need about 8 oz of walnuts for both the pastry and the filling. Lightly toast the walnuts at 350 degrees for about 8 - 10 minutes or until they just start to turn golden and give off a light toasty aroma. 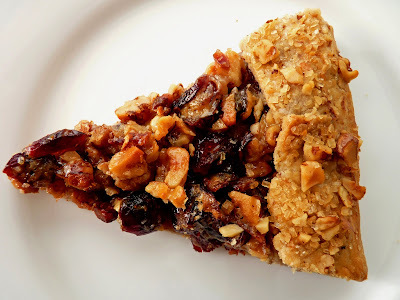 - The filling will appear a bit liquid but as it chills the cream and sugar will be absorbed by the nuts and dried cranberries. - You can substitute dried cherries for the cranberries. Berenbaum advises against substituting almonds (too hard) or pistachios (too soft) for the walnuts. - The recipe calls for 1/4 cup of white sugar for the filling but I used 2 T white and 2 T packed dark brown. - The pastry dough has less sugar and less butter to make it less fragile and easier to handle. The walnuts in the pastry dough should be finely ground with the flour to make handing and rolling the dough easy. - Desaulniers calls for up to 1/4 C extra flour to roll out the dough. I didn’t need to use nearly that much and I found the dough to be very easy to work with after it was chilled. Just be sure to use enough so the dough isn’t sticking as you roll it out and use a pastry brush to dust off any excess flour remaining on the surface of the pastry. For the filling, coarsely chop 1 1/2 cups of walnuts. Bring cream & sugar just to a boil over medium heat, stirring until the sugar is dissolved. Lower heat and simmer for 6-8 minutes, stirring occasionally until the mixture becomes slightly thickened. Remove pan from heat and add dried cranberries, walnuts and cinnamon and combine thoroughly. Line a 9" pie pan with plastic wrap. Transfer the filling to the pie pan, spreading it to an even layer across the bottom of the pan. Refrigerate for at least 2 hours. It can be chilled up to 24 hours. 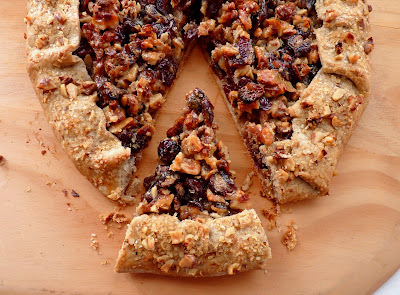 For the pastry, subtract 2 tablespoons of walnuts from the 1/2 cup. Chop the 2 tablespoons into small pieces, combine with 1 tablespoon of sugar and set aside as a garnish to sprinkle on top of the formed pastry before baking. Place the flour, 1 teaspoon of sugar, salt and remaining walnuts in the bowl of a food processor. Process until the nuts are finely ground into the flour mixture. Add the cold butter pieces and pulse until the texture is like coarse meal with a few larger pieces of butter. Whisk together egg yolk & ice water. Add to dough mixture and pulse until dough begins to come together in clumps and there are no dry flour patches. Turn the dough out onto a piece of plastic, bring it all together and form into a disc. Wrap tightly and chill for 30 minutes or until firm enough to roll. When ready to assemble the crostata, place the dough on a piece of parchment paper lightly dusted with flour. Roll into a 14" circle, using a light dusting of flour as you go to prevent sticking. Place rolled dough and the parchment paper onto a baking sheet or pizza pan. Invert the chilled filling on the dough, discard the plastic wrap and fold the dough over the filling. Refrigerate for at least 10 minutes or until your oven is ready. For the egg wash, combine the egg, water and salt. Brush the top of the pastry lightly with egg wash and sprinkle with the 2 tablespoons of chopped walnuts and sugar. Bake for about 30 minutes or until the pastry is golden brown and the filling is bubbling. Cool for at least 15 minutes on a wire rack.